Bed to patient ratio is still unsatisfactory at 2.1-2.5. 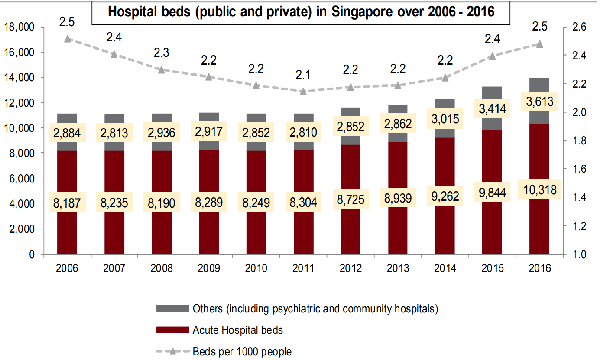 Hospital beds (from both restructured and private hospitals) in Singapore have grown at 2.3% CAGR from 2006 to 2016, with additional 3,200 acute care beds and 1,050 community care beds from the upcoming Sengkang General and Community Hospital (2018), Outram Community Hospital (2020), Integrated Care Hub (2022), and Woodlands General Hospital (2022). According to CIMB, other healthcare facilities in the pipeline include a new National Cancer Centre, Health City Novena Complex (by 2030), polyclinics, family medicine clinics, and more aged-care facilities. Meanwhile, the proportion of beds per 1,000 people stayed largely within the range of 2.1 to 2.5, similar to UK’s 2.6 hospital beds per 1,000 population, and the US’s 2.8. We expect the opening of new public hospitals and additional infrastructure investments to culminate into more hospital beds for Singapore. Even with the upcoming Sengkang General and Community Hospital (2018), Outram Community Hospital (2020), Integrated Care Hub (2022) and Woodlands General Hospital (2022), there will only be an additional 3,200 acute care beds and 1,050 community care beds. Based on the pipeline of new hospitals, as well as a projected population size of 5.8m to 6.0m by 2020 and 6.5m to 6.9m by 2030, according to the 2013 government White Paper, Singapore’s hospital bed to 1,000 people ratio will inch up slightly to an estimated 2.6-2.8 over 2020 to 2030, still below the Organisation for Economic Cooperation and Development (OECD) countries’ average of 4.7 acute hospital beds per 1,000 population in 2015. Japan and Korea have the highest hospital bed density (as of 2015 per 1,000 population), at 13.2 and 11.5 respectively, which we attribute to the higher proportion of ageing population. In 2016, the number of elderly (aged 65 and above) comprised 27.7% and 13.6% of the total population in Japan and Korea, respectively, based on local government estimates.